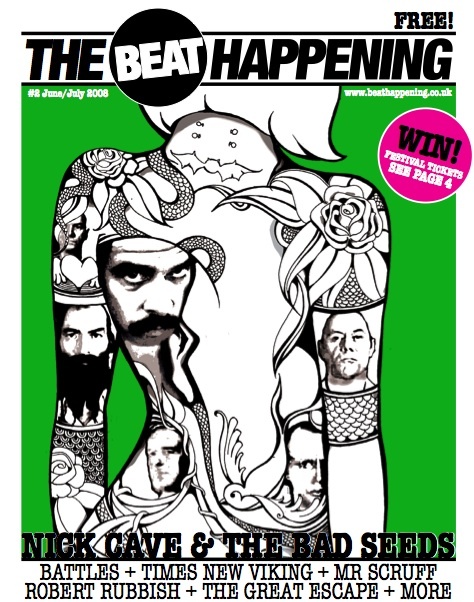 An article what I wrote for the new Beat Happening. As dark clouds hang from the edges a of humid summer afternoons, so Nick Cave has spent four decades looming at the peripherals of Popular Culture; glowering and jowly like Cerberus�s pup, the eternal flames of Hades have flickered in his heavy, lambent eyes, a deathly glare cast over the tyrannous world stretched before him. As introductions go this may appear a mite heavy on the Brimstone, and for this I apologise, but it is not without just cause: Cave has built an unparalleled body of work incorporating music, film and literature and dealt almost exclusively in the language of foul parables and Biblical retribution. If, in the dark church of counter culture, Mark E Smith is the Hip Priest then Nick Cave is rightfully ordained the Black Bishop, growling from the pulpit with woeful tales of an iniquitous, Old Testament God- not the kindly old Man with a white beard and fair, open hands, but the one with the leather jacket who gets drunk at parties and pretends he�s the Devil.